Research: Directed diffusion of single molecules. Diffusion is of great practical and theoretical interest because it is a spontaneous process that minimises a concentration gradient. The diffusion of large polymer molecules, with chain-like structures are particularly interesting. ABOVE: The movie above shows the directed diffusion of a polymer chain across a surface energy gradient. The white chain of beads represents a low molecular weight (5kDa) polyethylene glycol polymer molecule, which has a high diffusion coefficient (i.e. is very mobile) in aqueous solution. Biologists have known for a long time that cells can sense surface chemical gradients, and use these to direct their growth or movement (a process called haptotaxis). It is through processes like these that bacteria hunt down food, and nerve cells extend from sensor organs to our brains. In this work, however, we show that a simple surface energy gradient can direct the movement of surface-adsorbed polymer molecules. Alkyl thiols adhere strongly to a gold to produce a 'self assembled monolayer', with the thiol (sulfur) group in intimate contact with the metal, and the hydrophobic alkane chain projecting into solution (depicted in blue in the movie above). We can oxidise selected regions of this surface by exposure to UV light guided down a tapered optical fibre. The oxidised molecules no longer stick to the metal, and can be replaced with a thiol with a different tail group, in this instance a strongly hydrophilic carboxylic acid (depicted in red in the movie above). In this way two different surfaces are prepared: the hydrophobic alkyl surface, and the hydrophilic carboxylic acid surface, but between the two is a gradient where some alkyl molecules remain, interspersed with the replacement carboxylic acid bearing molecules . 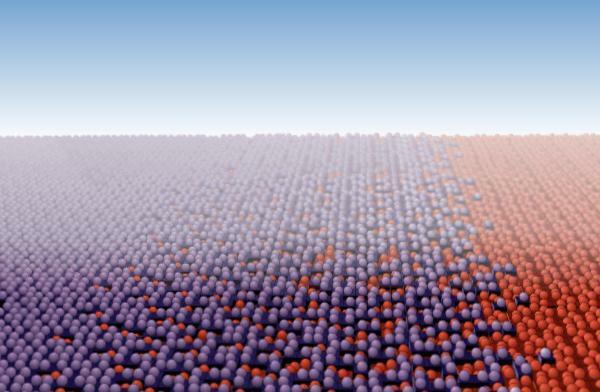 Atomic force microscopy, which allowed us to image the surface gradient (using a technique variant called 'friction force microscopy' or FFM), and to measure how strongly and over how much of their length, the PEG molecules adhered to different types of surface (using another technique variant called single molecule force spectroscopy). Above: A friction force micrograph of a carboxyl channel (bright) in a hydrophobic alkyl monolayer. The graph shows the friction force for a cross-section through the channel, and the peripheral surface energy gradients. Fluorescence correlation spectroscopy, which, coupled to confocal microscopy allows us to measure the diffusion properties of individual molecules. These studies showed that PEG molecules adopt a train-like configuration on hydrophobic surfaces, with most of the chain in contact with the surface, as depicted on the left-hand side of the animation. The chain moves very slowly on this surface. On the hydrophilic surface (right of the animation) the chain only adheres over a short portion of its length. The rest of the chain hangs into solution, where it can move rapidly. 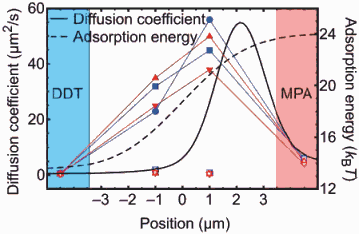 Right: Graph showing how the diffusion coefficients and adsorption energy for the polymer chain changes across the surface energy gradient. On the gradient of surface energies between these extremes, the polymer chain shows directed movement towards the hydrophilic end of the gradient. In addition, the molecule has a larger diffusion coefficient (it moves very much faster) than on either hydrophobic or hydrophilic surfaces . Controlling the movement of molecules in this way is of great interest to scientists, and has a number of potential commercial uses, for chemical separations, in micro-reactors and so on. It is amazing that such a shallow gradient can induce such dramatic effects in something like a simple polymer. Can we control the motion of more sophisticated objects such as single cells? This is not something that we have yet tried, but it must be worthwhile given that this is how cells move along gradients naturally. Cells have evolved to grow in specific directions and if one wants to repair muscle or an organ, it is not sufficient to simply induce cell growth, but one needs control direction and structure. If surfaces can be created whereby the controlled movement of cells leads to the desired growth of cells then there can be serious implications for regenerative medicine. This is a long way from a cure for paralysis, and the like, but it is food for thought. This work has been featured in several newswires, and a short report can be found in the magazine Materials Today. We acknowledge financial support from the the Engineering and Physical Sciences Research Council (GR/T07473/01). P. Burgos, M. Geoghegan, and G. J. Leggett “Generation of molecular-scale compositional gradients in self-assembled monolayers” Nano Lett. 7 3747-52 (2007). P. Burgos, Z. Zhang, R. Golestanian, G. J. Leggett, and M. Geoghegan “Directed single molecule diffusion triggered by surface energy gradients” ACS Nano 3 3235-43 (2009).